Easy. Time saving. And no shot blasting required. 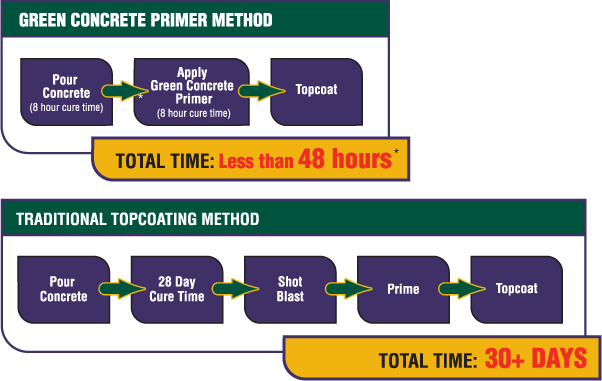 Green Concrete Prime & Seal combines the functions of a curing agent, sealer and permanent primer � all in one. It can be applied up to 8 hours after pouring the slab* and is ready for topcoating after only an additional 8 hours of dry time, allowing you to go from green concrete to a finished floor in less than 48 hours. Prime. Seal. Dustproof. In no time. This two-component, easy-to-apply high-solids epoxy primer protects against dust, water and mild chemicals. Can be used as a concrete primer or stand-alone sealer. Fast cure for recoat in 1/2 to 2 hours, even in colder environments. Slight odor. VOC compliant with <100 g/l. Available in Amber Clear. Application Type I. This two-component, virtually 100% solids epoxy resin polymer seals the substrate and securely bonds it to the floor coating or patching materials. May be used before applying floor coatings, toppings, patching materials, or alone as a concrete sealer. Exceeds the tensile and sheer strength of the concrete itself, and cures in only 6-8 hours. Available in Natural, Light Gray and Super Light Gray. Application Type I. Film Thickness 8 mils MAX.